In a sigheh arrangement, the duration of the marriage and the dowry are specified in advance, and once the time period elapses, be it an hour or a year, both parties are free to go their separate ways. I couldn’t make this stuff up if I wanted to. In theocratic, hardline Iran, there is a religiously-sanctioned hookup culture. Based on shifting demographic trends in Iran, it appears that Iranians have gotten a little too comfortable with temporary marriage and have decided to forgo the traditional kind. Last week, I wrote about China’s pending mother shortage and what it means for China’s economy in the decades ahead. Along those same lines, today I’m going to turn a popular misconception about Iran on its head. There is a widespread belief in the West that we’re being “outbred” by unstable countries that are hotbeds for terrorism, particularly in the Islamic world. To an extent, this is true. The average woman in Afghanistan, Iraq and Yemen, to pick three high-profile examples, can expect to have 5.1, 4.1 and 4.2 children in their respective lifetimes. 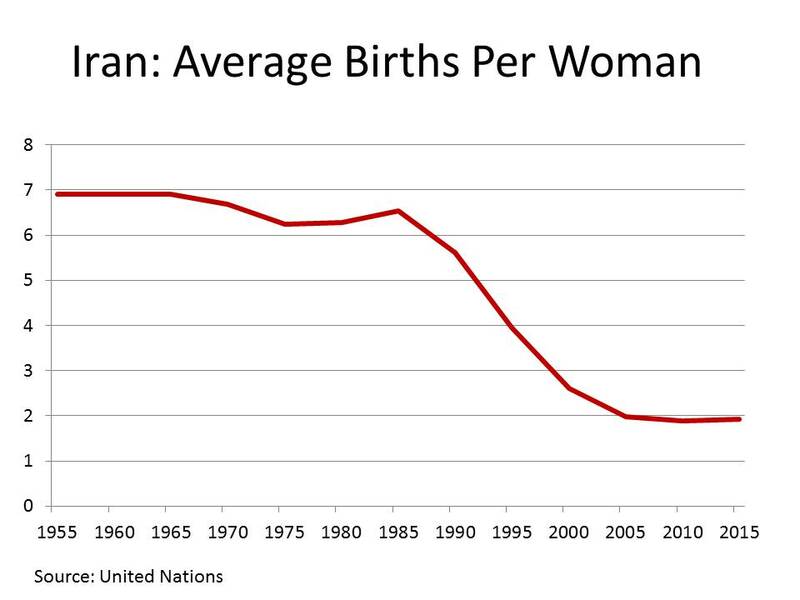 Iran had similarly high birthrates…before the Islamic revolution of 1979. Ironically, Iran had much higher birthrates before the revolution, when it was officially a western-allied nation and women walked the streets freely with their heads uncovered. But just six years after the mullahs took over, the fertility rate collapsed. By 2005, it had fallen below the population replacement rate. Today, at 1.9 children per women, the Iranian fertility rate is equal to that of the U.S. and actually lower than that of France! Iran is changing. Women make up more than 60% of college students. With higher levels of female education, the average age of marriage and first childbirth rises and the smaller the average family size gets. According to the Alliance Center for Iranian Studies, the average age of marriage today is between 25 and 35 among men, and between 24 and 30 among women. Divorce has a way of putting the brakes on family size, and about one out of three marriages in Tehran now end in divorce. For better or worse, Iran is starting to look a lot more “Western,” at least when it comes to family life. Iran won’t be a rogue state forever. We probably won’t see real political change while Ayatollah Khamenei, Iran’s supreme leader, is alive and kicking. But he’s also 75 years old and won’t be around forever. Change will come, and a lot sooner than most people realize. Will the mullahs give up power without a fight? Probably not. And Iran may never have a full-blown revolution and regime change. But as Iranian society changes, I expect the government to at least subtly tone down its anti-western rants and to start behaving like a “normal” country. This post first appeared on Economy & Markets. By now, everyone should be aware of the anti-regime protests taking place in Iran. The country is experiencing unrest not seen since the 1979 Islamic revolution that deposed the Shah and brought the current regime to power. The “spark” that ignited this rebellion was the disputed presidential election, of course. But the “tinder” that caused this fire to spread are Iran’s demographics. As you can see from the charts below, Iran is primed for revolution. We’ll start first with a flashback to the original 1979 revolution, the one in which young Islamic militants shocked the world by holding 52 American diplomats hostage for over a year. This is the event that most historians mark as the beginning of the global Islamist movement. The reasons for the revolution are too complex to be discussed in a short blog post, but looking at Chart 1 it’s not hard to see why it was a success. During the Islamic Revolution, 1979 American Baby Boomer student revolutionaries in the 1960s used to say “Never trust anyone over 30,” and there is a reason for this. A young person has nothing to lose and has the youthful audacity to believe in change (for better or worse). But by the time a person reaches their 30s, they have a career, a spouse, a family, and a stake in the status quo. As we age, we get more resistant to change because, at the end of the day, we have more to lose. Why risk your livelihood for abstract ideals like “democracy” or “freedom”? Consider Chart 2: Iran’s population is absolutely dominated by the 15-34 age group. This cohort includes everything from rebellious teenagers to idealistic college students to frustrated and unemployed 20- and 30-somethings — exactly the kind of people with the reckless abandon needed to launch a revolution. We have no real way to handicap the likelihood of success for Iran’s young revolutionaries today. Their passion is impressive, but they are up against some truly nasty people who will do anything to stay in power. The Tiananmen Square protests in China twenty years ago were inspirational to those watching, but in the end they accomplished very little. The might of the Chinese state was too much for a ragtag band of students. Still, given their sheer numbers today, the young Iranians have a fighting chance to un-do the Islamic revolution of their parents’ generation and replace it with a more liberal revolution of their own.